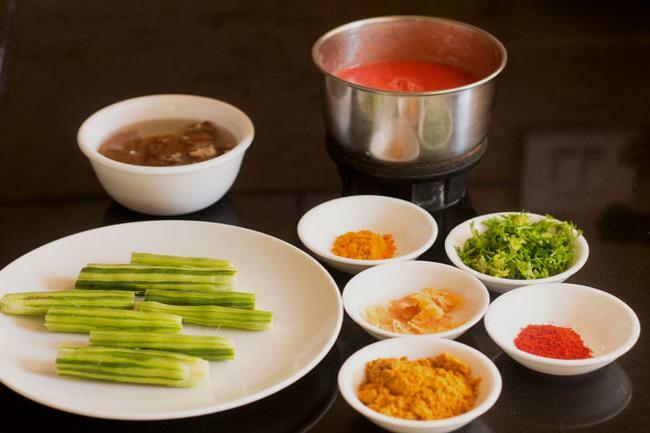 drumstick rasam recipe with step by step photos. 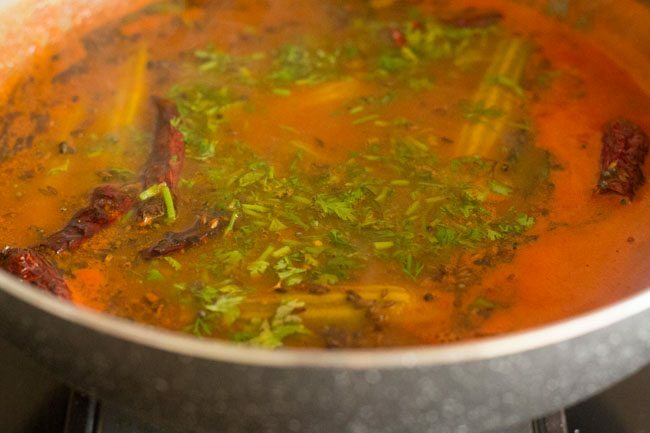 one more variation of making rasam with veggies. 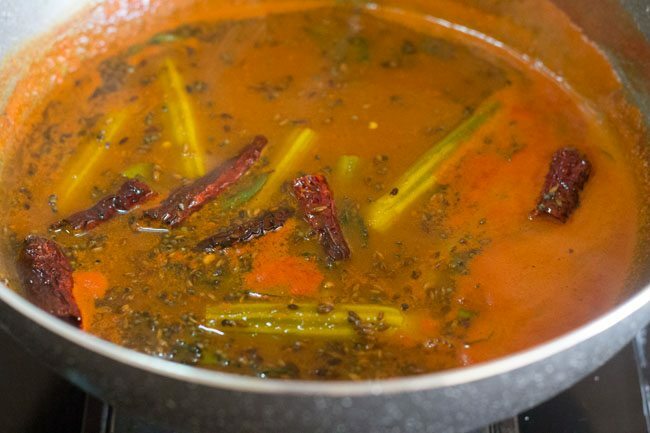 this is a tangy version of rasam made with drumsticks. in case you are wondering what are drumsticks, you can see them in the first pic. the tender long green pods of moringa oleifera. 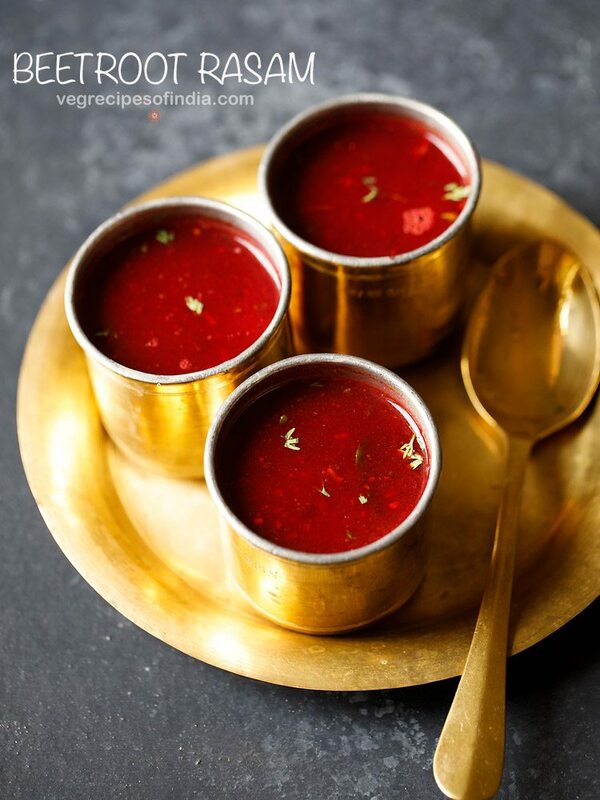 rasam is a soup like appetizer or drink made in south india. 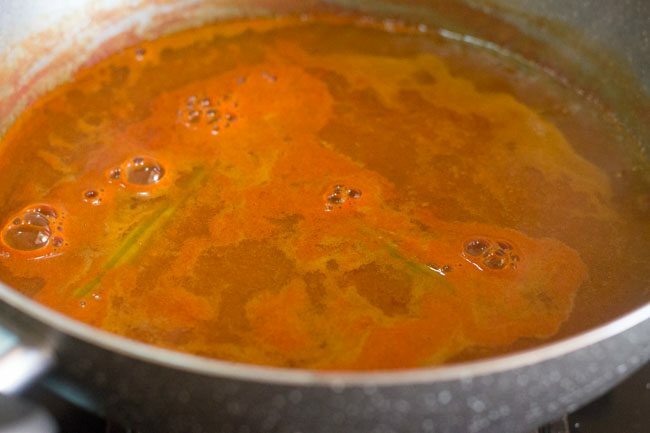 more about rasam on this tamarind rasam post. 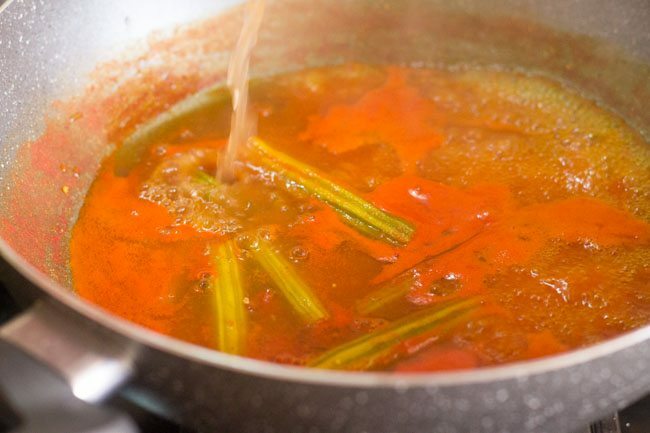 this drumstick rasam has a base of tomato with tamarind. 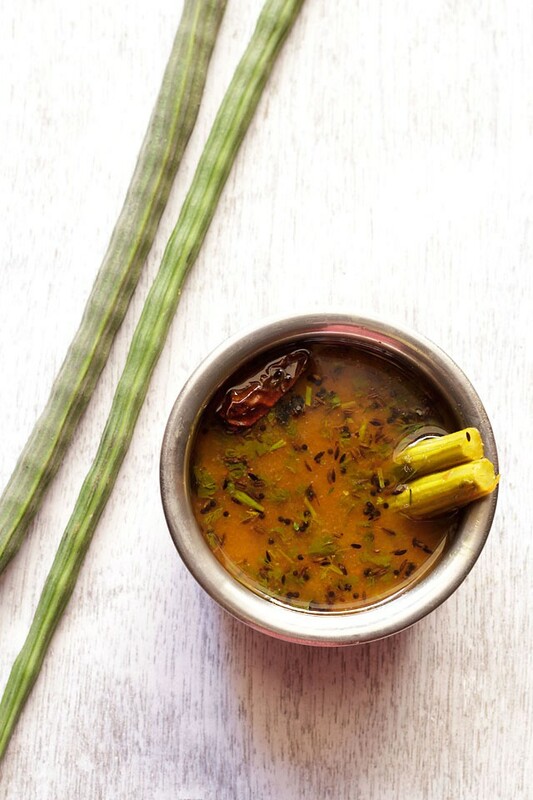 you can also make the rasam with tamarind only. rasam powder is added in this one. 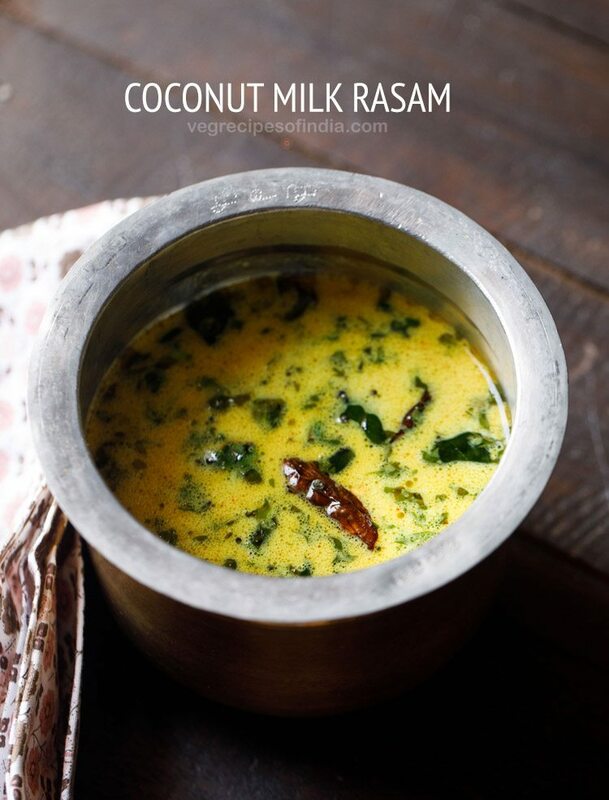 in the absence of rasam powder, this is a no onion and no garlic rasam recipe too. 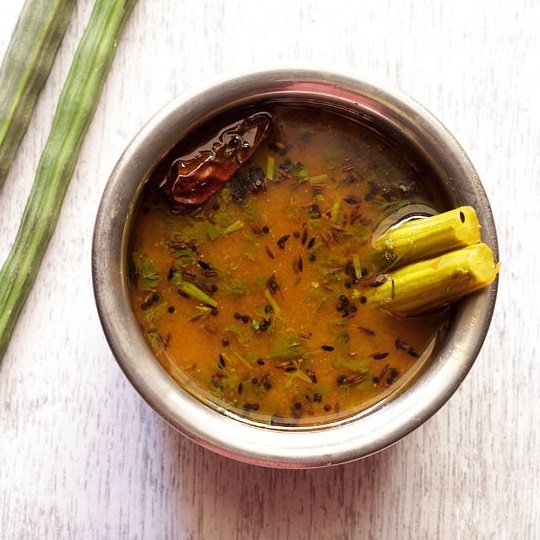 the drumstick rasam is tangy and slightly sweet due to the addition of jaggery warmed with spices and the flavor of drumsticks. i had made this rasam to go along with some medu vada and rice. you can just have the rasam plain too. 1. soak 1 tablespoon seedless tamarind in ½ cup water for 30 minutes. 2. rinse 2 drumsticks. 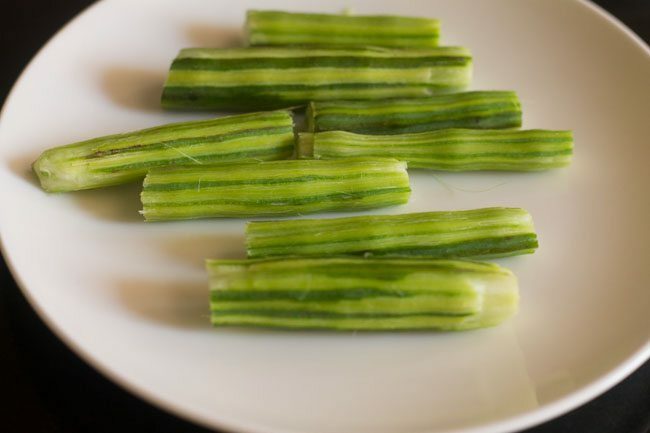 then peel and chop them lengthwise into 1.5 to 2 inch long pieces. 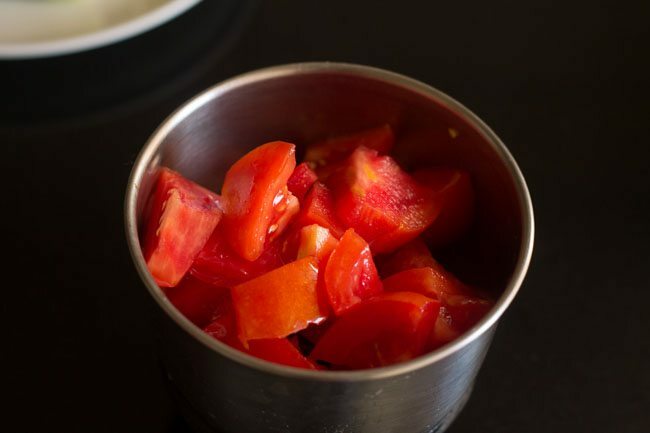 3. measure and keep all the ingredients ready for the rasam. 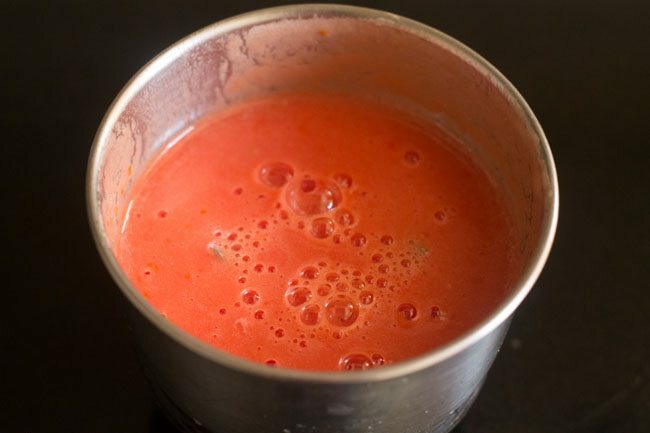 4. chop 2 medium sized tomatoes into the blender. 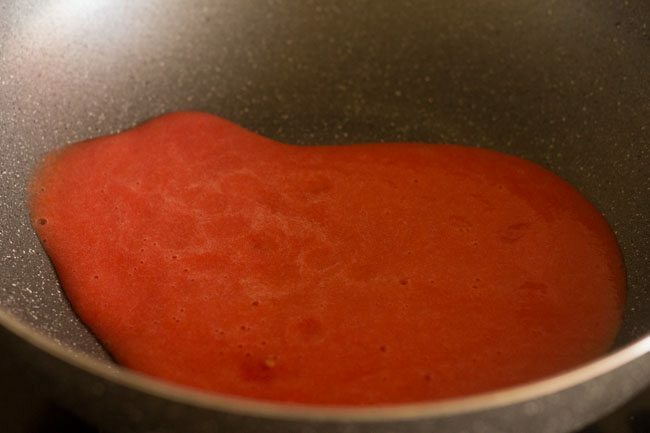 5. blend till its pureed. 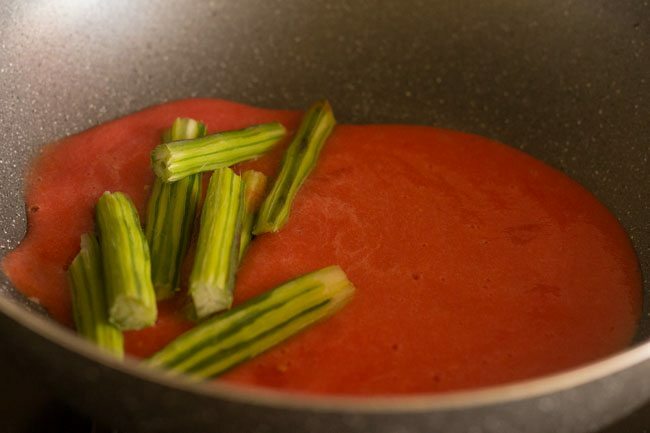 6. add the tomato puree to a pot or pan. 7. next add 2 whole drumsticks which are chopped lengthwise. 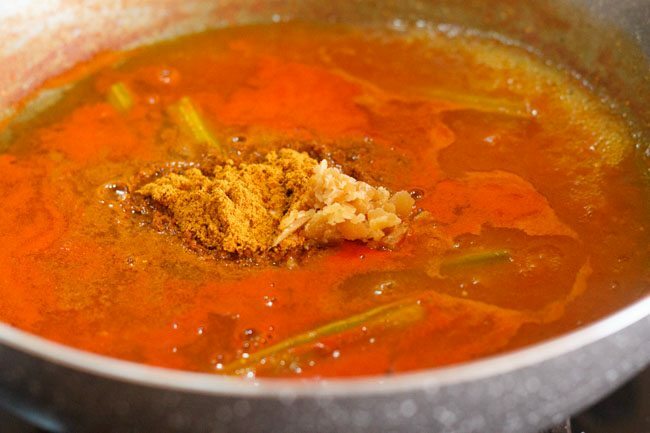 8. add ½ teaspoon turmeric powder and ¼ to ½ teaspoon red chili powder. 9. now add 2 cups water in a pot or pan or as required. 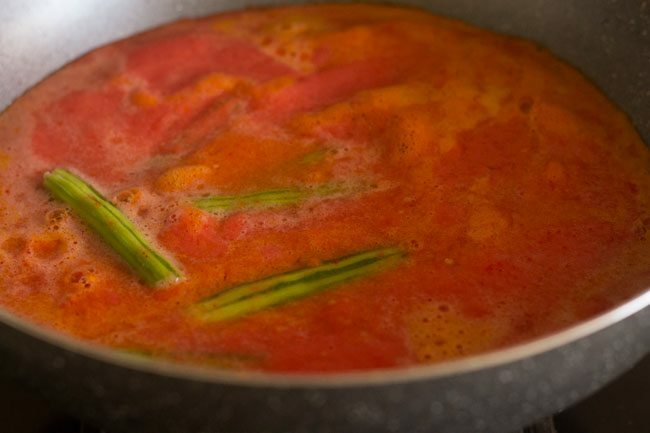 10. bring to a boil and simmer till the drumsticks are cooked, uncovered. 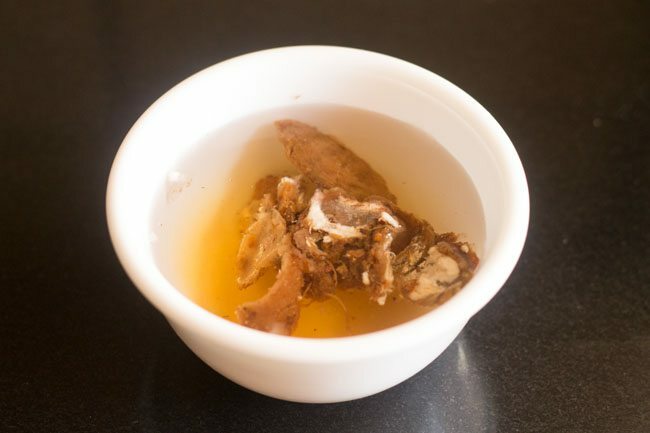 11. squeeze the tamarind pulp straight into the bowl of water. 12. add the tamarind pulp. 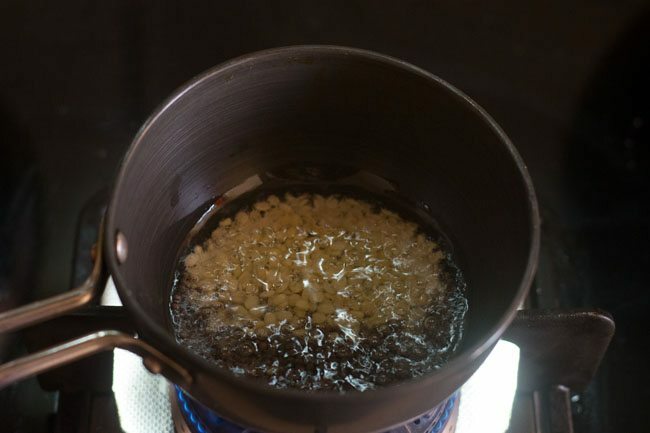 13. also add 2 to 3 teaspoons rasam powder and 1 to 2 teaspoon grated jaggery. 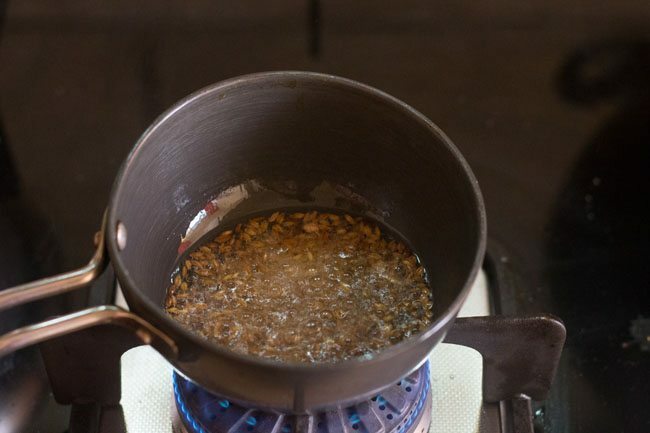 16. simmer for 5-6 minutes more or till the raw aroma of the tamarind goes away. 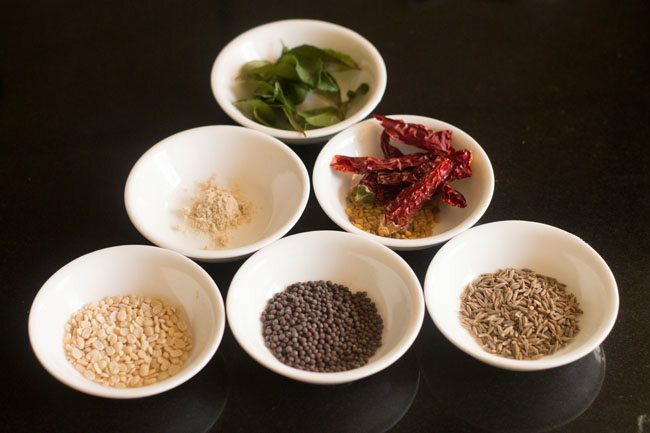 17. meanwhile measure and keep all the spices ready for the tempering of drumstick rasam. 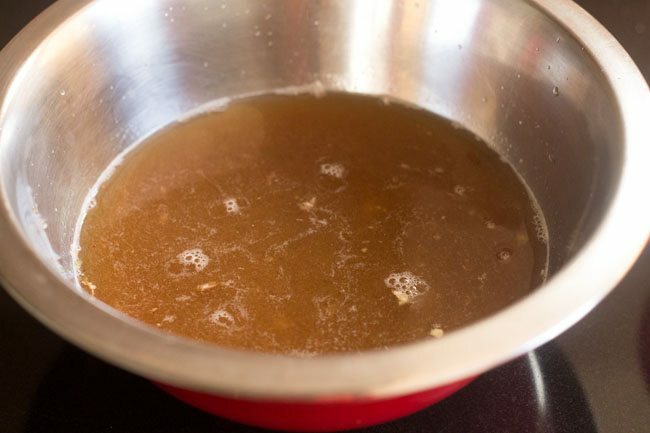 18. in a small pan, heat 1 to 1.5 tablespoon oil. add 1 teaspoon mustard seeds and 1 teaspoon urad dal first. 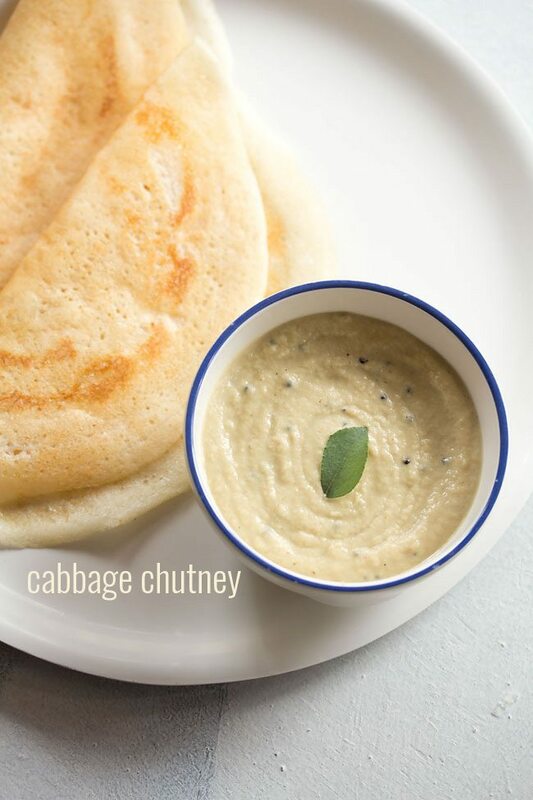 let the mustard seeds pop first and at the same time the urad dal would also start getting browned. 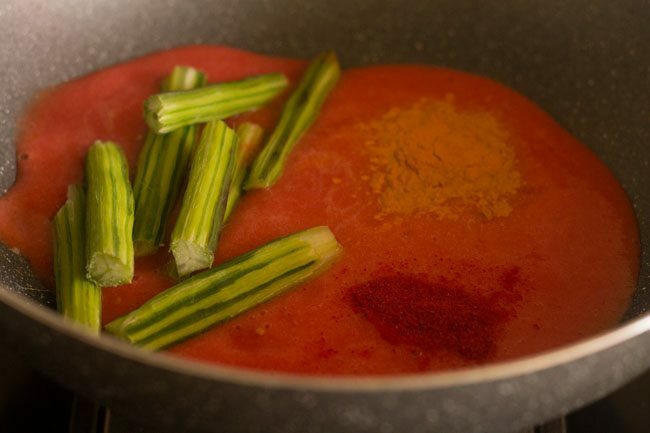 19. now add 1 teaspoon cumin seeds and fry for a few seconds. 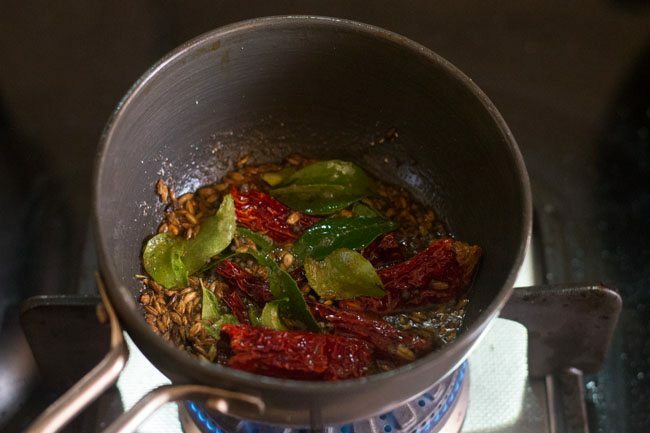 20. add 2 dry red chilies, ¼ teaspoon fenugreek seeds, 1 sprig of curry leaves, 1 pinch of asafoetida (hing) and fry for some seconds. 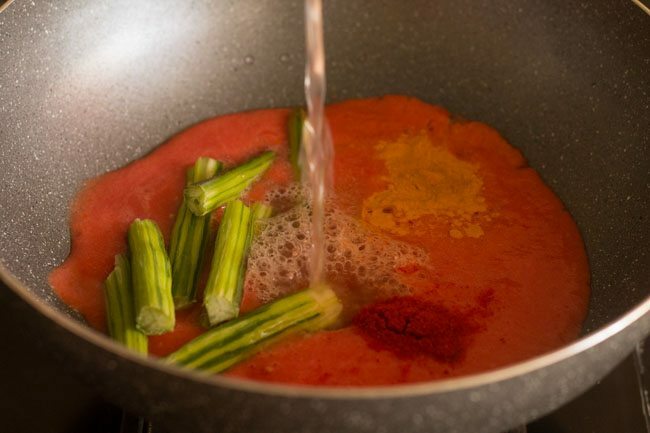 21. pour the tempering mixture in the drumstick rasam. 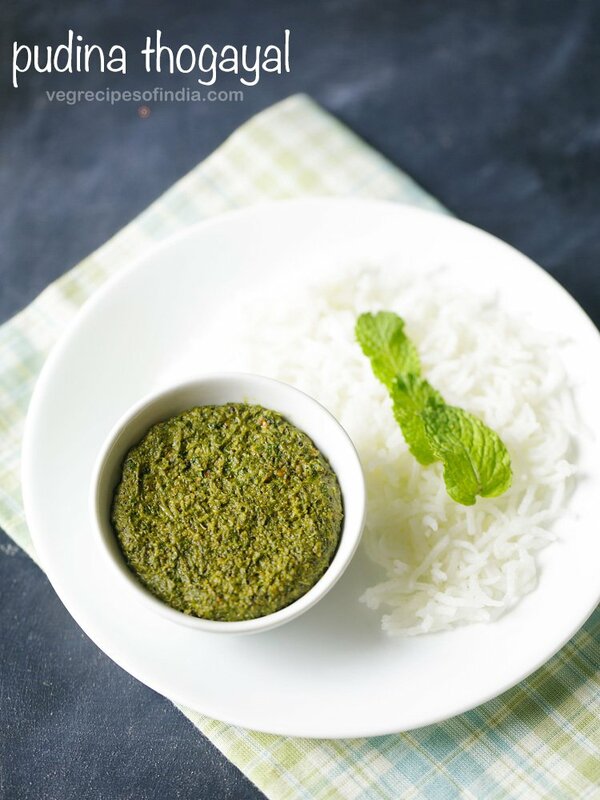 22. stir and add ¼ cup coriander leaves. mix one last time. I am afraid I dont see any drumsticks in the first pix.Am I missing some pics? Also, what do you mean it will be a no onion, no garlic recipe if I eliminate the rasam podi? I went to the tamarind rasam recipe and it says to add garlic, curry leaves and hing while tempering.Which is again confusing because in the list of ingredients for tempering, there was no mention of garlic anywhere…? the drumsticks are placed next to the rasam bowl. are you checking from mobile. in mobile the first pic does not show. well, i have not used any garlic or onion in this recipe, hence is no onion no garlic. ready rasam podi or rasam powder, does not have onion or garlic. 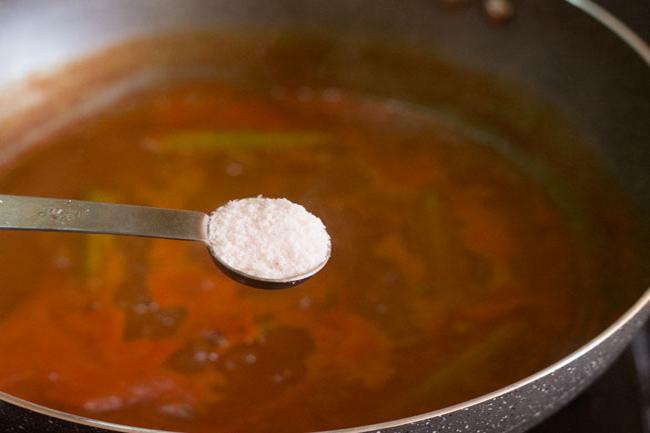 the rasam powder made for tamarind rasam is homemade and hence have added garlic. 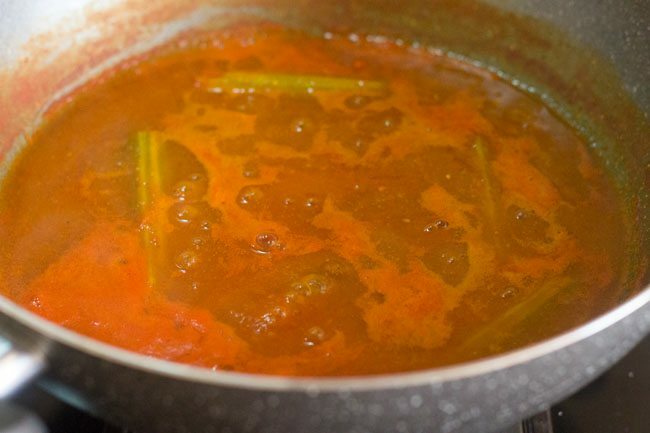 for the tempering in tamarind rasam, garlic is optional and hence i have not added. but i will update the post. i hope your confusion is solved. jhanvi, the tender flesh which is inside the drumstick is squeezed in the mouth and the outside green part is not eaten. I love rasam but never tried it with drumsticks.. Thanks for sharing the recipe..it looks yum!! Nice one Dassana. 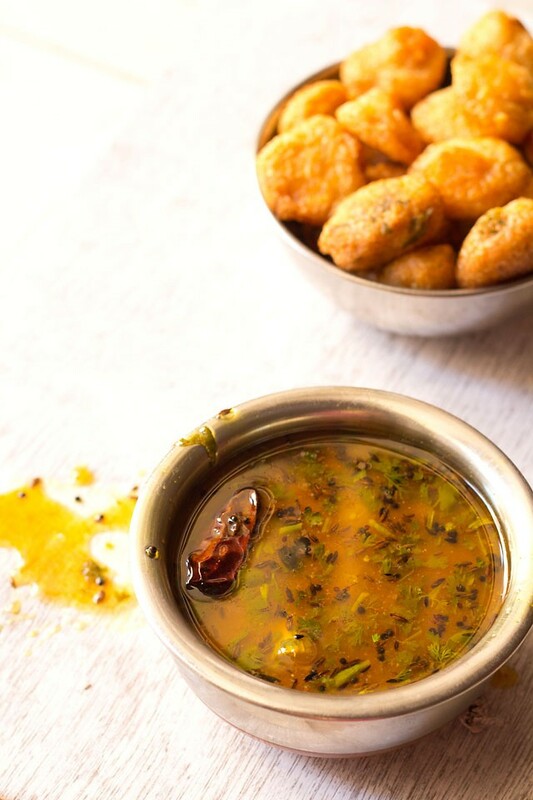 We prepare drumstick rasam in a similar way using freshly ground rasam masala and skip jaggery. Looks super good.